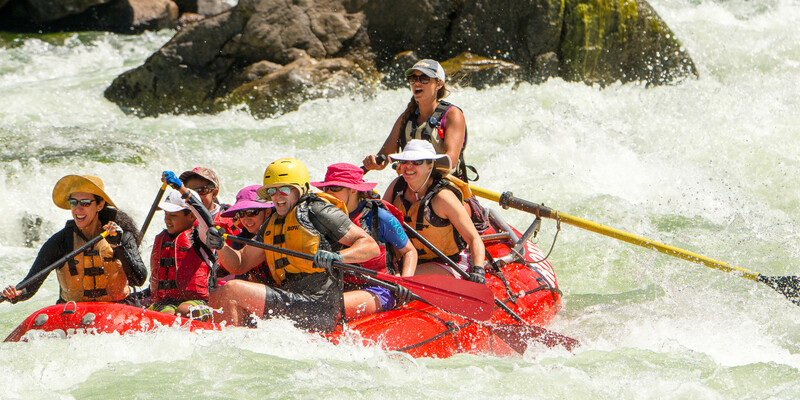 ROW Adventures runs some of the world’s most famous rivers including Idaho’s Middle Fork of the Salmon and Snake in Hells Canyon, as well as Oregon’s Rogue and Montana’s Upper Missouri. We also are known as the river connoisseur’s company because we have trips on rivers that few others float. The legendary Bruneau, remote Owyhee, thunderous Lochsa and boisterous Moyie to name a few. River canyons are a place to feel the earth under foot and the heavens above. A place you can find both peace and the mysterious thrill of gazing upon life and the world and being one with it. The rapids we encounter are exciting, heart-pounding punctuations of the poetry of the river trip experience. Between the rapids there is calm and time to gaze upon soaring eagles and magnificent pines. At camp there is hiking, good food, camaraderie around the campfire, and star-gazing. Our guides are trained professionals with the technical skills to manage the risk inherent in outdoor adventures. They are also leaders, artists, amateur psychologists, group dynamic specialists, talented cooks, earnest storytellers, natural historians and carry a smile and can-do attitude. The meals they prepare are made from fresh ingredients carried in coolers loaded with ice. The menu is varied, bountiful and delicious. We cook and clean up, leaving you time to hike, fish, read, visit, or simply relax on the river bank. These are soul-expanding places. Places to feel the freshness of a breeze, the power of the river, the glow of sunset. To share with us as we share ourselves with you.